Application fees prevent many college students from even applying for a passport. At a UNH Global event on April 5, 50 UNH students received their passports free of charge. 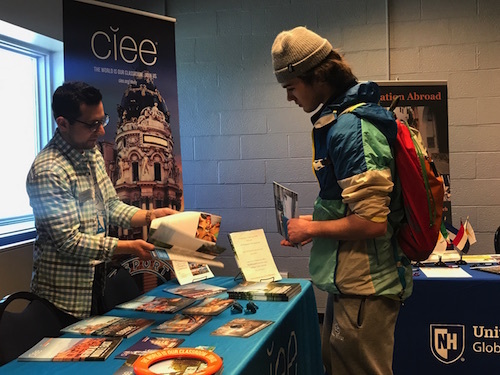 Staff from the Council On International Educational Exchange talked with students about study abroad options and scholarships. It’s undeniable that adventures and new experiences await those whose doors are opened to international travel, and UNH Global is helping open those doors for more students by breaking down one of the barriers that keeps them shut. At the MUB on April 5, UNH Global distributed free passports to 50 students as part of the Council On International Educational Exchange Passport Giveaway program, which encourages study abroad by defraying the cost of a passport. "The Passport Giveaway program is one of several initiatives to open opportunities to non-traditional students," says Beth Kilinc, administrative director for Education Abroad at UNH. "The goal was to reach students who may never have considered study abroad or who may not think that it is for them." All of the recipients were first-time passport holders who have demonstrated financial need or come from a population of students typically not represented in study abroad. Students from all UNH campuses and majors were invited to apply. During the giveaway event, recipients met with passport agents to finalize their applications, talked with UNH advisors about study abroad options and scholarships and left with holders for their shiny new passports, which will arrive in the coming weeks. Recipients pointed out how smooth the experience was, from applying to be considered to having their application documents checked by agents. Theatre major Morgan Simmons '19 says she would have been nervous about filling out the government forms correctly, but staff walked her through the process, “making it very easy,” she says. "In the last meeting, when we mailed out the paperwork, they made you feel so celebrated." UNH Global had provided each recipient with a coupon to have a free passport photo taken at Thompson Hall prior to the event. “We wanted to have the whole process right here on campus for students, to make sure each step was easy and accessible to all,” Kilinc says." The new passport holders were encouraged to set up an appointment with a UNH study abroad counselor to further explore their opportunities. Education Abroad program manager Catherine D'Auteuil says the passports are not just for students planning to go abroad through UNH. “Some have spoken of wanting to go to somewhere closer … which is just as great. If this encourages and helps students get to any new place and new experiences at any time, then we're moving towards our goal," says D'Auteuil. Another recipient, civil engineering major Christopher Looney '21, says, “I’ve always wanted to go to Canada, and didn't think I'd be able to so soon, but now I can." Since U.S. passports last 10 years before expiring, Kilinc says that even if students aren't able to travel right away, the documents are "opening up a decade of possibilities for Wildcats to study, live, work and travel abroad,” she says. “Having a passport is a tangible symbol and critical first step towards international travel and experiences." Simmons didn't think she would ever apply for a passport because no one in her immediate family had one, and she wasn’t sure it was something she needed. "Now,” she says, “I feel like the world is at my feet, and I can't wait to go see it."